ExoT is degraded by proteasomes and is polyubiquitinated. (A–C) HeLa cells were cocultivated with PA103ΔexoU/exoT(G-A+) for 1.5 hours in the (A) presence or (B) absence of 10 μM lactacystin. Extracellular bacteria were then killed by the addition of amikacin. Protein synthesis of internalized bacteria was inhibited by the addition of chloramphenicol. At the indicated times, cytoplasmic extracts were prepared, and translocated ExoT was assayed by immunoblotting with anti-ExoT antiserum (upper panels, A and B). To control for loading efficiency, the blots were probed with anti-GAPDH mAbs (lower panels, A and B). (C) The rate of degradation of ExoT was quantified by normalizing the amount of ExoT at each time to the corresponding amount of GAPDH. This ratio was plotted as a percentage of the ratio at time 0 (2 hpi). Shown are the means ± SD. In some cases, the error bars are too small to be seen. (D and E) HeLa cells were transfected with the indicated plasmids for 18 hours; 10 μM lactacystin was added, and the cells were further incubated for 4 hours. (D) To assess overall levels of transfected proteins, whole-cell lysates were immunoblotted with anti-HA (upper panel) or anti-Myc (for ExoT) (lower panel). 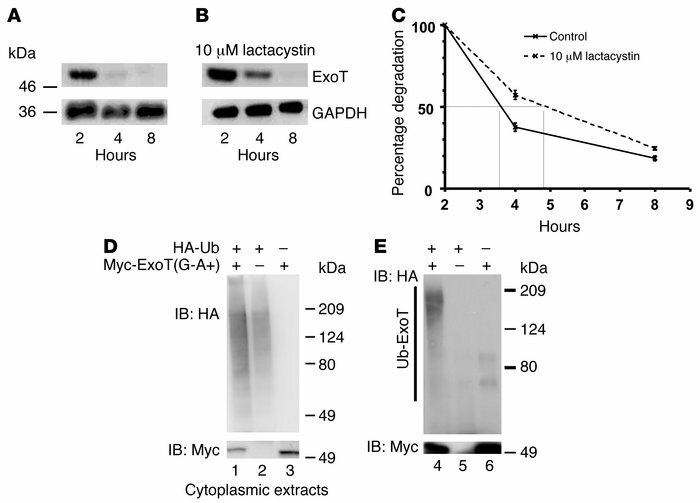 (E) ExoT was immunoprecipitated using anti-ExoT antiserum and immunoblotted with anti-HA (upper panel, ubiquitinated ExoT) or anti-Myc (lower panel, total ExoT). Polyubiquitinated ExoT, indicated by the slower migrating forms of ExoT, is only visible in cells cotransfected with the ExoT and HA-Ub vectors (lane 4, upper portion of E).